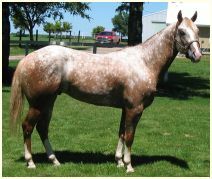 Skip is a chestnut snowcap appaloosa with four stockings and a blaze. He is a Grand Champion Stallion at standing at MJ Stables in Hartley, Iowa. Thanks to Mike and Jeri Johnson for allowing me to display this lovely photo of Skip. Jeri made an interesting observation that supports the idea that male appaloosas are more likely to show color than females (see the text above for more discussion of this). From 2 foal crops 100% of Skip's colts were colored, but none of his fillies.